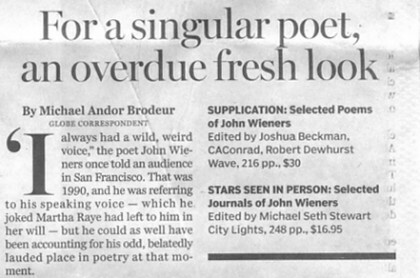 Here’s a little belated notice that the Boston Globe has penned a great review of John Wieners’s Supplication and Stars Seen in Person: Selected Journals, in the Sunday Arts section of October, 18. “Supplication” doesn’t come as a correction of the Black Sparrow “Selected” so much as a refinement. It offers a slimmer stack of poems, yet somehow feels more generous . . . Read alongside the four journals spanning 1955-1969 assembled in “Stars Seen in Person,” the lilting, drifting highs, lows, and noise of his poems come to feel more like carefully distilled concentrates of his grander, wilder project of seeing, saying, and seizing as many moments as he could . . . A hazard of Wieners’s long-held position on the fringe as a cult antihero is that we don’t properly see how central his spirit figures into what American poetry was becoming at mid-century. Even these decades later, Wiener’s poems — so fresh and fluid, lurid, and luminous — still feel too vital to leave behind. Read the whole review, by Michael Andor Brodeur, here.